EDIT: Giveaway is officially over. Congratulations to Mary Michelotti for submitting the randomly chosen 1142nd entry. You may think you have candy bowls full of time to pick out a costume, but Halloween will creep up and sink its fangs into your neck before you know it. One trick-or-treater will have it made this year. 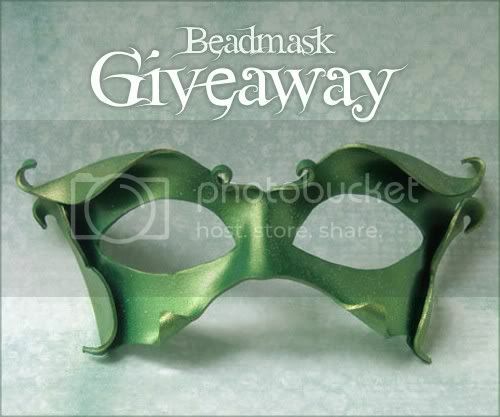 Andrea of Beadmask is giving away a leather mask in winner's choice of base and accent colors. The simply stunning design is called "Little Sprite," but with the right accessories, it can transform its wearer into any fairy, nymph, elemental or magical creature imaginable. I wore my olive green and gold masquerade mask to FaerieCon 2011 as a tree elf. It was amazingly comfortable and flattering to my face shape. Andrea hand cuts each mask from her own original pattern. The quality tooling leather is then sculpted, hand painted and sealed with a protective top coat. The final touch is a gleaming dusting of ultrafine glitter. The entire mask measures approximately 5.5" high x 11" wide, and ties in the back with a high quality stretch ribbon. If you're impressed by this magnificent mask, just wait until you see her other leather creations! Use the Rafflecopter below to enter to win Andrea's Halloween giveaway before 11:59pm EST on August 30, 2012. Wow! This mask is quite gorgeous! Perfect for the Faire and holiday season coming up. Thanks for hosting such an amazing giveaway! The spriteling mask is also lovely! *A* Most your masks are eyecandy. I wish you lived in the same country so I can personally visit and buy your stuff. She has some really fantastic items in her etsy store! Love the Red Oak Headband Fascinator - Leather Leaf With Vintage Glass Stone, Feathers And Beadwork. I loooooove her stuff! She's such an amazing artist! Love her work and love this blog! I'm partial to the dragonrider headdress. All of her work is awesome. I love the Autumn Oak Leaf Barrettes. I <3 her work. She custom made a mask for my wedding. My husband and I have ours now framed in a shadowbox above the fireplace for everyone to see. So many beautiful things. I think I love the stag leather mask the most. Wow, what beautiful items!! I love all the masks so much but I think my favorite is the Day of the Dead Sugar Skull mask! So beautiful! I love the "Sculpted Leather Mask - Lady Of The Leaves"! Wow, what amazing work. Hard to pick a favourite! I love the Little Bat in Coppery Orange. Wow I was JUST looking at this page the other day, can't believe I could win mask! I know my wife would just love the leather stag mask. This mask is so gorgeous! These are fantastic! I love the Djinn Mask! Red Oak Headband Fascinator - Leather Leaf With Vintage Glass Stone, Feathers And Beadwork. the Imp Goblin Leather Mask in Shimmering Olive and Bronze. Love the little spriteling mask!!! My fav mask is the Frost Fairy Filigree Leather Mask. It is trully a piece of art! I'l love to win this! The crown is absolutely breathtaking. I'm also particularly fond of the undine mask and the frost fairy mask. Everything is exceptional, though! The shop is so cool! I love the masks but my favorite mask is Black Cat Leather Mask. Hard to choose! I like the Black Cat Leather Mask. Christina - xristya@rock.com - I love the Beaded Pendant Mermaid Necklace! I love the Frost Fairy Filigree Leather Mask! Beaded Leather Chignon Pin With Peacock Feather Accents...this piece is amazing, the colors and detail! I love it!! I like the sculpted leather mask. Beautiful items! I love the Aurora Borealis Floral Bracelet. I loooove the 'Pixie Cat in Purple and Bronze', it's just gorgeous! I've also posted this on http://www.facebook.com/StrictlyCanadianCouponsAndContests?ref=tn_tnmn thanks for the giveaway! I like the black cat leather mask! Cute shop! Love the leaf earrings and black cat mask! My favourite item is the Original Beadwoven Necklace - Vintage Sugalite With Antique Seed Beads And Vermeil. - Judith R.
Love the wicked leather bird mask in crimson. What a great shop! I just love the Leather Mask - Mardi Gras Fairy In Gold With Green And Purple Swirls. It is really beautiful. My favorite item is the Absinthe Fairy Leather Mask In Chartreuse And Emerald Green. I am Jaque R.
I like the Sculpted Leather Mask - Lady Of The Leaves! I love the peacock barette! I love this cuff bracelet. Frost Fairy Filigree Leather Mask! I am lucky enough to own one of Beadmask's peacock-feather barrettes, and I gotta say,no photos could do her products justice! But for the fall I can't wait to see, I'd really love to have this http://www.etsy.com/listing/103026160/calavera-leather-mask-with-vintage-glass -- a perfect mask! The mask is lovely and in my favorite shade. Love the Lady Of The Leaves mask. I love the black leather crown! I like some many but will pick Frost Fairy Filigree Leather Mask. My favorite item is the Sculpted Leather Mask - Lady Of The Leaves. Leather Mask - Pixie Cat in Purple and Bronze is great! My favorite is Jackdaw Sculpted Leather Mask - Corvus Raven Or Crow In Black And Pewter. i want the black cat leather mask. I like the black cat leather mask. I really like the Filigree Leather Crown In Black! These are all gorgeous. They remind me of the ballroom scene in Labyrinth. I love the Little Spriteling - Leather mask, but if I won, I'd probably let my sister choose one. She'd love these. Filigree Leather Crown In Black, Pewter And Silver, thanks! I like the Sculpted Leather Mask - Lady Of The Leaves. Love the Frost Fairy Filigree Leather Mask! Jackdaw Sculpted Leather Mask - Corvus Raven Or Crow In Black And Pewter.